The origin of the solar system has long been a fascinating subject posing difficult questions of deep significance. It takes one to the heart of the question of our origins, of how we came to be here and why our surroundings look the way they do. Unfortunately, we currently lack a self-consistent model for the origin of the solar system and other planetary systems. The early stages of planet formation are obscure, and we have only a modest understanding of how much the orbits of planets change during and after their formation. At present, we cannot say whether terrestrial planets similar to the Earth are commonplace or highly unusual. Nor do we know the source of the water that makes our planet habitable. Over a decade ago, the first planet orbiting another Sunlike star was discovered. Since then, new planets have been found at an astounding rate, and roughly 200 objects are known today. Most of these planets appear to be gas giants similar to Jupiter and Saturn. Recently, several smaller planets have been found, and these may be akin to Uranus and Neptune, or possibly large analogs of terrestrial planets like Earth. In the last 10 years, there have been a number of highly successful space missions to other bodies in the solar system, including Mars, Saturn, Titan, and several asteroids and comets. Information and images returned from these missions have transformed our view of these objects and greatly enhanced our understanding of their origin and evolution. The discovery that one can physically separate and analyze star dust–presolar grains that can be extracted from meteorites and that formed in the envelopes of other stars—has meant that scientists can for the first time test decades of theory on how stars work. The parallel development of methods for extracting isotopic information at the submicron scale has opened up a new window to the information stored in such grains. The development of multiple collector inductively coupled plasma mass spectrometry has made it possible to use new isotopic systems for determining the mechanisms and timescales for the growth of bodies early in the solar system. Our theoretical understanding of planet formation has advanced substantially in several areas, including new models for the rapid growth of giant planets, a better understanding of the physical and chemical evolution of protoplanetary disks, and the growing realization that planets can migrate substantially during and after their formation. The recent development of powerful new computer codes and equations of state has facilitated realistic, high-resolution simulations of collisions between planet-sized bodies. Scientists are discovering that the resolution of their models significantly changes the outcome, and the race is on to find reliable solutions. Today, the formation of the solar system is being studied using three complementary approaches. Astronomical observations of protoplanetary disks around young stars are providing valuable information about probable conditions during the early history of the solar system and the timescales involved in planet formation. The discovery of new planets orbiting other stars is adding to the astonishing diversity of possible planetary systems and providing additional tests for theories of how planetary systems form. Physical, chemical, and isotopic analyses of meteorites and samples returned by space missions are generating important information about the formation and evolution of objects in the solar system and their constituent materials. This field of cosmochemistry has taken off in several important new directions in recent years, including the determination of timescales involved in the formation of the terrestrial planets and asteroids, and constraints on the origin of the materials that make up the solar system. Theoretical calculations and numerical simulations are being used to examine every stage in the formation of the solar system. These provide valuable insights into the complex interplay of physical and chemical processes involved, and help to fill in some of the gaps when astronomical and cosmochemical data are unavailable. In this chapter, we will describe what we currently know about how the solar system formed and highlight some of the main areas of uncertainty that await future discoveries. Star formation is the process by which dense regions within molecular clouds in interstellar space, sometimes referred to as "stellar nurseries" or "star-forming regions", fuse to form stars. The solar system formed 4.5–4.6 billion years (Ga) ago by collapse of a portion of a molecular cloud of gas and dust rather like the Eagle or Orion Nebulae. Some of the star dust from that ancient Solar Nebula has now been isolated from primitive meteorites. Their isotopic compositions are vastly different from those of our own solar system and provide fingerprints of nearby stars that preceded our Sun. These include red giants, asymptotic giant branch stars, supernovae, and novae. It has also become clear from studying modern molecular clouds that stars like our Sun can form in significant numbers in close proximity to each other. Such observation also provide clues as to how own solar system formed because they have provided us with images of circumstellar disks—the environments in which planetary objects are born. Observations from space-based infrared telescopes such as the Infrared Astronomical Satellite (IRAS) have shown that many young stars give off more infrared radiation than would be expected for blackbodies of the same size. This infrared excess comes from micron-sized grains of dust orbiting the star in an optically thick (opaque) disk. 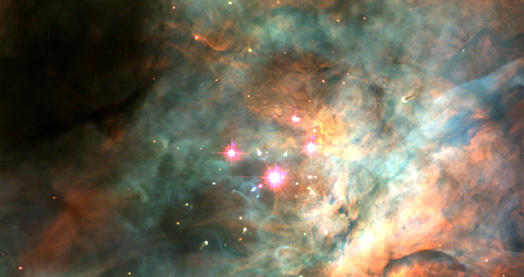 Dark, dusty disks can be seen with the Hubble Space Telescope surrounding some young stars in the Orion Nebula. A proplyd, a syllabic abbreviation of an ionized protoplanetary disk, is an externally illuminated photoevaporating disk around a young star. These disks have been dubbed proplyds, short for protoplanetary disks. It is thought that protoplanetary disks are mostly composed of gas, and in a few cases this gas has been detected, although gas is generally much harder to see than dust. The fraction of stars having a massive disk declines with stellar age, and large infrared excesses are rarely seen in stars older than 107 years. In some cases, such as the disk surrounding the star HR 4796A, there are signs that the inner portion of a disk has been cleared of dust, perhaps due to the presence of one or more planets. In the solar system, the planets all orbit the Sun in the same direction, and their orbits are very roughly coplanar. This suggests the solar system originated from a disk-shaped region of material referred to as the solar nebula, an idea going back more than 2 centuries to Kant and later Laplace. The discovery of disks of gas and dust around many young stars provides strong support for this idea and implies that planet formation is associated with the formation of stars themselves. Stars typically form in clusters of a few hundred to a few thousand objects in dense regions of the interstellar medium called molecular clouds. The gas in molecular clouds is cold (roughly 10 K) and dense compared to that in other regions of space (roughly 104 atoms/cm3) but still much more tenuous than the gas in a typical laboratory “vacuum.” Stars in these clusters are typically separated by about 0.1 pc (0.3 lightyears), much less than the distance between stars in the Sun’s neighborhood. It is unclear precisely what causes the densest portions of a molecular cloud (called molecular cloud cores) to collapse to form stars. It may be that contraction of a cloud core is inevitable sooner or later due to the core’s own gravity, or an external event may cause the triggered collapse of a core. The original triggered collapse theory was based on the sequencing found in the ages of stars in close proximity to one another in molecular clouds. This suggests that the formation and evolution of some stars triggered the formation of additional stars in neighboring regions of the cloud. However, several other triggering mechanisms are possible, such as energetic radiation and mass loss from other newly formed stars, the effects of a nearby, pulsating asymptotic giant branch (AGB) star, or a shock wave from the supernova explosion of a massive star. Gas in molecular cloud cores is typically moving. When a core collapses, the gas has too much angular momentum for all the material to form a single, isolated star. In many cases, a binary star system forms. In others cases, a single protostar forms (called a T Tauri star or pre-main sequence star), while a significant fraction of the gas goes into orbit about the star forming a disk that is typically 100 astronomical units (AU) in diameter. Temperatures in T Tauri stars are initially too low for nuclear reactions to take place. However T Tauri stars are much brighter then older stars like the Sun due to the release of gravitational energy as the star contracts. The initial collapse of a molecular cloud core takes roughly 105 years, and material continues to fall onto both the star and its disk until the core is depleted. The spectra of T Tauri stars contain strong ultraviolet and visible emission lines caused by hot gas falling onto the star. This provides evidence that disks lose mass over time as material moves inward through the disk and onto the star, a process called viscous accretion. This process provides one reason why older stars do not have disks, another reason being planet formation itself. Estimated disk accretion rates range from 10−6 to 10−9 solar masses per year. The mechanism responsible for viscous accretion is unclear. A promising candidate is magneto-rotational instability (MRI), in which partially ionized gas in the disk becomes coupled to the local magnetic field. Because stars rotate, the magnetic field sweeps around rapidly, increasing the orbital velocity of material that couples strongly to it and moving it outward. Friction causes the remaining material to move inward. As a result, a disk loses mass to its star and spreads outwards over time. This kind of disk evolution explains why the planets currently contain only 0.1% of the mass in the solar system but have retained more than 99% of its angular momentum. MRI requires a certain fraction of the gas to be ionized, and it may not be effective in all portions of a disk. Disks are also eroded over time by photo-evaporation. In this process, gas is accelerated when atoms absorb ultraviolet photons from the central star or nearby, energetic stars, until the gas is moving fast enough to escape into interstellar space. T Tauri stars often have jets of material moving rapidly away from the star perpendicular to the plane of the disk. These jets are powered by the inward accretion of material through the disk coupled with the rotating magnetic field. Outward flowing winds also arise from the inner portions of a disk. It is possible that a wind arising from the very inner edge of the disk (called the x-wind) can entrain small solid particles with it. These objects will be heated strongly as they emerge from the disk’s shadow. Many of these particles will return to the disk several AU from the star, and may drift inward again to repeat the process. Some of these particles may be preserved today in meteorites. The minimum mass of material that passed through the solar nebula can be estimated from the total mass of the planets, asteroids, and comets in the solar system. 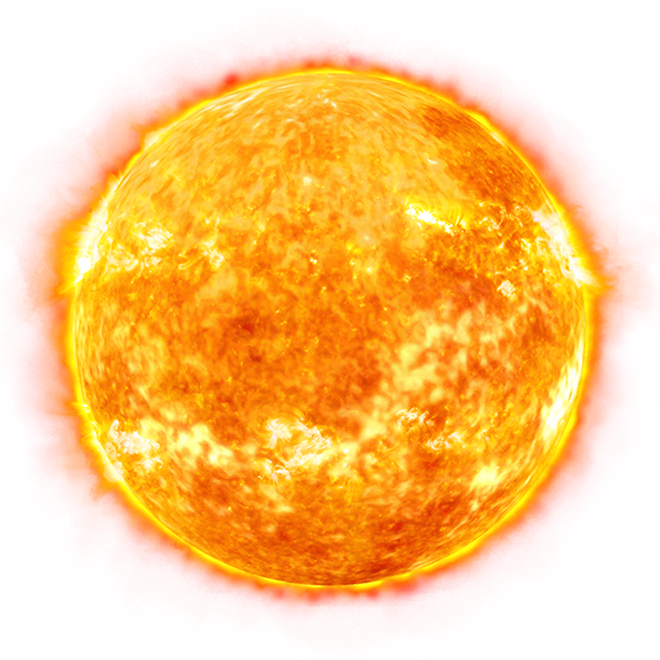 However, all of these objects are depleted in hydrogen and helium relative to the Sun. Ninety percent of the mass of the terrestrial planets is made up of oxygen, magnesium, silicon, and iron (Fig. 4), and although Jupiter and Saturn are mostly composed of hydrogen and helium, they are enriched in the heavier elements compared to the Sun. When the missing hydrogen and helium is added, the minimum-mass solar nebula (MMSN) turns out to be 1–2% of the Sun’s mass. The major uncertainties in this number come from the fact that the interior compositions of the giant planets and the initial mass of the Kuiper Belt are poorly known. Not all of this mass necessarily existed in the nebula at the same time, but it must have been present at some point. Current theoretical models predict that planet formation is an inefficient process, with some mass falling into the Sun or being ejected into interstellar space, so the solar nebula was probably more massive than the MMSN. Gas in the solar nebula was heated as it viscously accreted toward the Sun, releasing gravitational energy. The presence of large amounts of dust meant the inner portions of the nebula were optically thick to infrared radiation so these regions became hot. Numerical disk models show that temperatures probably exceeded 1500 K in the terrestrial planet forming region early in the disk’s history. Viscous heating mainly took place at the disk midplane where most of the mass was concentrated. The surfaces of the disk would have been much cooler. The amount of energy generated by viscous accretion declined rapidly with distance from the Sun. In the outer nebula, solar irradiation was the more important effect. Protoplanetary disks are thought to be flared, so that their vertical thickness grows more rapidly than their radius. As a result, the surface layers are always irradiated by the central star. For this reason, the surface layers of the outer solar nebula may have been warmer than the midplane. The nebula cooled over time as the viscous accretion rate declined and dust was swept up by larger bodies, reducing the optical depth. In the inner nebula, cooling was probably rapid. Models show that at the midplane at 1 AU, the temperature probably fell to about 300 K after 105 years. Because the energy generated by viscous accretion and solar irradiation declined with distance from the Sun, disk temperatures also declined with heliocentric distance. At some distance from the Sun, a location referred to as the ice line, temperatures became low enough for water ice to form. Initially, the ice line may have been 5–6 AU from the Sun, but it moved inward over time as the nebula cooled. Some asteroids contain hydrated minerals formed by reactions between water ice and dry rock. This suggests water ice was present when these asteroids formed, in which case the ice line would have been no more than 2–3 AU from the Sun at the time. Meter-sized icy bodies drifted rapidly inward through the solar nebula due to gas drag (see Section 5). When these objects crossed the ice line, they would have evaporated, depositing water vapor in the nebular gas. As a result, the inner nebula probably became more oxidizing over time as the level of oxygen from water increased. When the flux of drifting particles dwindled, the inner nebula may have become chemically reducing again, as water vapor diffused outward across the ice line, froze to form ice, and became incorporated into growing planets. Humans have gazed at the heavens and tried to understand the cosmos for thousands of years. Ancient civilizations placed great emphasis on careful astronomical observations. Early Greek astronomers were among the first to leave a written record of their attempts to explain the cosmos. For them, the universe was Earth, the Sun, the Moon, the stars, and five glowing points of light that moved among the stars. The Greeks named the five points of light — called planetes, or wanderers — after their gods. The Romans later translated the names into Latin — Mercury, Venus, Mars, Jupiter, and Saturn — and these are the names astronomers use today. Planetary features are named by the International Astronomical Union, founded in 1919. For more information about the names of planets, moons, and features, consult the Gazetteer of Planetary Nomenclature website at planetarynames.wr.usgs.gov. Ancient observers believed that the Sun and all the other celestial bodies revolved around Earth. Astronomers gradually realized that the Earth-centered model did not account for the motions of the planets. In the early 17th century, Galileo Galilei’s discoveries using the recently invented telescope strongly supported the concept of a “solar system” in which all the planets, including Earth, revolve around a central star — the Sun. Planetary moons, the rings of Saturn, and more planets were eventually discovered: Uranus (in 1781) and Neptune (1846). The largest known asteroid, Ceres, was discovered between Mars and Jupiter in 1801. Originally classified as a planet, Ceres is now designated a dwarf planet (but retains its asteroid label), along with Pluto, which was discovered in 1930; Eris, found in 2003; Haumea, found in 2004; and Makemake, found in 2005. There may be hundreds of dwarf planets in Pluto’s realm. Our solar system formed about 4.6 billion years ago. The four planets closest to the Sun — Mercury, Venus, Earth, and Mars — are called the because they have solid, rocky surfaces. Two of the outer planets beyond the orbit of Mars — Jupiter and Saturn — are known as gas giants; the more distant Uranus and Neptune are called ice giants. Earth’s atmosphere is primarily nitrogen and oxygen. Mercury has a very tenuous atmosphere, while Venus has a thick atmosphere of mainly carbon dioxide. Mars’ carbon dioxide atmosphere is extremely thin. Jupiter and Saturn are composed mostly of hydrogen and helium, while Uranus and Neptune are composed mostly of water, ammonia, and methane, with icy mantles around their cores. The Voyager 1 and 2 spacecraft visited the gas giants, and Voyager 2 flew by and imaged the ice giants. Ceres and the outer dwarf planets — Pluto, Eris, Haumea, and Makemake — have similar compositions and are solid with icy surfaces. NASA spacecraft are enroute to two of the dwarf planets — the Dawn mission visits Ceres in 2015 and the New Horizons mission reaches Pluto in that same year. Neither Ceres nor Pluto has been previously visited by any spacecraft. Moons, rings, and magnetic fields characterize the planets. There are 146 known planetary moons, with at least 27 moons awaiting official recognition. (Three of the dwarf planets have moons: Pluto has five, Eris has one, and Haumea has two.) The planetary moons are not all alike. One (Saturn’s Titan) has a thick atmosphere; another has active volcanoes (Jupiter’s Io). New moons are frequently discovered, so moon counts can change. Rings are an intriguing planetary feature. From 1659 to 1979, Saturn was thought to be the only planet with rings. NASA’s Voyager missions to the outer planets showed that Jupiter, Uranus, and Neptune also have ring systems. Most of the planets have magnetic fields that extend into space and form a magnetosphere around each planet. These magnetospheres rotate with the planet, sweeping charged particles with them. How big is our solar system? To think about the large distances, we use a cosmic ruler based on the astronomical unit (AU). One AU is the distance from Earth to the Sun, which is about 150 million kilometers or 93 million miles. Particles from the Sun can reach far beyond the planets, forming a giant bubble called the heliosphere. The enormous bubble of the heliosphere is created by the solar wind, a stream of charged gas blowing outward from the Sun. As the Sun orbits the center of the Milky Way, the bubble of the heliosphere moves also, creating a bow shock ahead of itself in interstellar space — like the bow of a ship in water — as it crashes into the interstellar gases. The region where the solar wind is abruptly slowed by pressure from gas between the stars is called the termination shock. Two NASA spacecraft, launched in 1977, have crossed the termination shock — Voyager 1 in 2004 and Voyager 2 in 2007. In late 2011, Voyager 1 data showed that the spacecraft had entered the outermost region of the heliosphere. By 2013, Voyager 1 was about 18 billion kilometers (11 billion miles) from the Sun, and Voyager 2 was about 15 billion kilometers (9 billion miles) from the Sun. Scientists anticipate that Voyager 1 will cross into interstellar space, where gas and dust from other stars are found as well as the enormous Oort Cloud, within a few months to a few years. Both spacecraft should have enough electrical power to send data until at least 2020. It will be thousands of years before the two Voyagers exit the Oort Cloud, a vast spherical shell of icy bodies surrounding the solar system. As we explore the universe, we wonder: Are there other planets where life might exist? Are we alone? These are the great questions that science is now probing. Only recently have astronomers had the tools — sensitive telescopes on Earth and in space — to detect planets orbiting stars in other solar systems.